Google has released priority inbox for their Gmail services a year back which did not help many to manage their inbox properly. 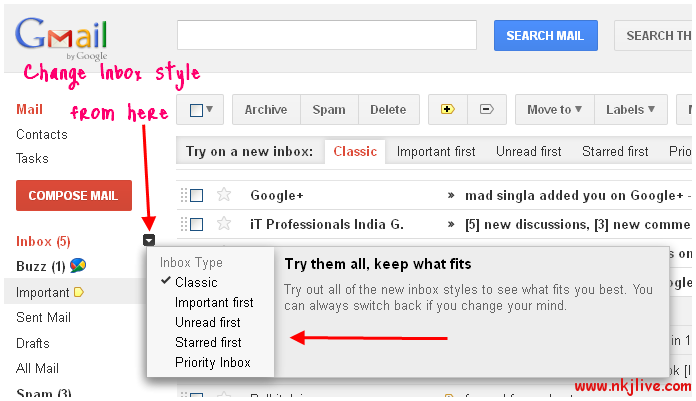 Now they have added multiple Inbox styles for the users to select the best one suiting their needs. A new Inbox styles bar has been added to the Gmail UI. All your important mails will be listed at the top. Importance in terms of people you are interacting with the most i.e. Top spot is given to mails from people you are communicating with. As the names goes, all your unread mails at the top and rest follow. As the name goes, all your starred mails at the top in chronological order and rest follow. That’s the old style i.e. Unread, important and starred mails are displayed in order and then rest follow. From last couple of months I was looking for Unread emails in my Gmail inbox but couldn’t find it and it was extremely painful to go to archives just to see what all are unread . But now this is extremely easy. You can close the bar if you don’t like it or is annoying you. I have closed the try new inbox tab, pls tell me how to regain it? Try clicking on the small down arrow button next to Inbox hyperlink on the left ….